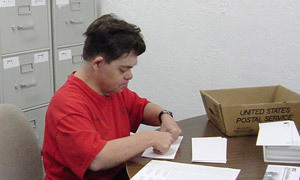 Bulk Mailing - ACHIEVE Human Services, Inc.
Mail Wizards Bulk Mailing Services prepares bulk mailing for customers in the Yuma area. We have done complete mailings, were all materials are dropped off to us and we prepare it and drop it off at the post office, as well as doing jobs that only require individual steps like stuffing and sealing envelopes. Postage depends on what the post office classifies the mail as, and the amount/weight of the total number of pieces.